Gossip is toxic to any work environment. What happens with gossiping, it shuts down communication, it shuts down trust. Sharing 'displeased feelings' poisons the hearts of others with negative emotional resonance. Don't do it! To be able to uproot gossiping in your family, community and on world level, first we have to understand Gossiping. Gossiping is not simply to talk about others. There is evil spiritual power working behind it. It goes around the logic and obsesses directly the heart of the listener, because it is transferred through sharing heartisticly 'displeased emotions' or is accompanied with 'heartistic laughter'. Thus the heart opens and the poison obsesses directly the heart of the other. It's a very effective way of multiplication of evil. People partaking in it often admit, "I know it we were talking evil, but it was so heartistic, we had such a good time and trust among us." Look at Hyung Jin using laughter, ridiculing and false gossips to ruins Mother's reputation. Where does this evil intend comes from? How to explain this evil joy and satisfaction they gain through it? "True Mother is True Father’s eternal partner and the position of True Parents cannot be compromised." Truth reveals Satan's ways, and will liberate Sanctuary Church, once they understand. Truth does not aim to ruin, but to free, liberate and unite. Gossip aims to destroy. Gossip is a vicious cycle that needs to be stopped. We see how they counter attack, try to make you feel guilty for confronting them. But be mature, be a loving parent; they need to be corrected and helped to understand and overcome this bad habit. It's a fact: Malicious spread of rumors with an evil intend to ruin TM and UC, with no remorse.. that's what Sanctuarly Church is doing. Look at Yeon Ah's video, sharing small, personal things with evil twist and underhanded intend. This heartistic way of gossiping is the evilest of all. Doing it to his mother, makes it worse. Doing it towards TP makes it unforgivable. Read and learn HOW GOSSIPING WORKS, learn HOW TO STOP IT. "What's the consequence of sin?" After such prayer, God took my spirit to Hell. It was the Gossiping realm of the spiritual world. I can't describe the feeling, but it is the most painful place you can imagine. I spend few hours there, talking to people and trying to understand them. Something was very wrong with these people. No matter what you do, or not do, you are always accused. Whatever you say was twisted in such a vicious way. My heart was agonizing, feeling the evil energy they produce. That's what these people did in their life. For them this resonance of heart was normal. They observed externally, accused and gossiped. My heart was in so much pain. But for them that's love - to share negtivities, laughing and ridiculing others. These are the poisonous Vitality Elements they nurtured themselves in their physical life - so that's what they continue doing in the spirit world. I can't imagine such evil games against each other in my own family. This will be Hell. Their very hearts were twisted. Yet, they looked clever, intelligent, heartistic, same like many humanistic members I know on earth. Read what's evil in Humanism. One has to be totally under his physical mind to do such things. Read, Liberate our Spirit Mind and you'll understand. Do you see how this very Gossiping-Hell, God has shown me in the spirit world, is actually return-resurrecting through Sanctuary Church. Whatever Mother says or does is always accused. She sits on one chair, they accuse. She sits on two chairs, they ridicule her. It's not what she does, it's the evil nature of their hearts, where the problem is. Their hearts are twisted! They are feeding on poisonous 'vitality elements'. It's unbearable to know that they will end up in Hell. After this experiences God gave me, I cannot escape, but feel what is the resonance of people's hearts. I hope you understand why I'm so urgent to solve it. My Spiritual Mind senses that and has no peace. My heart yearns to find the way to liberate them, liberate God of this pain. To be able to uproot it, first we have to understand Gossiping. God gave me many revelations and guidance in the following years, until I've learned how to help such people. I can do that! I do it constantly! God is love. He want's everyone in Heaven. I'm not only seeing spiritually, but I can change the spiritual environment around me. Can Lucifer gather all the feathers of the evil he was spreading throughout the history? Can Hyung Jin restore all the damage of his gossips? The sooner, the easier! Gossiping is bad, because it aims to ruin the other person’s reputation (Evil Purpose). No one is born evil. However, if you’re one to maliciously spread rumors about someone, to fog their reputation, you act as an evil person. It’s a vicious cycle and it needs to stop. You need to be confronted and helped to overcome your bad habit. We see Hyung Jin constantly spewing nasty things about Mother, making Sanctuary Church poisoned with negative energy, thoughts and emotions.. by telling secret, inner stories against his own family. That's Gossiping int the most evil of ways. Most gossip isn’t good gossip. Telling secret, inner stories against other member of the family, is an vicious thing to do. Such intrigues should never exist in the family. Where goes the trust ones such evil games start? In her video, Yeona Nim is doing it in heartistic, intimate way, that makes it easy to manipulate people's hearts negatively. In Family Therapy this is called Triangulation. If you talk to the victim of these gossips, you'll see where the description was reversed, changed, exaggerated - from wrong, self centered perspective. Remember, Gossiping is a direct expression of the Fallen Natures - not feeling God's love for them and multiplying evil. Those who love to spread gossips are also fake to people. One moment they are nice and best friends, the next, they turn around, "Did you see what she said", laughing behind your back. They lie or exaggerate to make stories and gossip more interesting. They present themselves as a victim, having hurt, displeased feelings, while having no remorse of ruining other person's lives. That makes them very effective manipulators. Same way, Hyung Jin and his wive, used small inner, personal facts and twisted them enough to create the most ugly and dark picture. All media negativity against our church was devised in the very same vicious way. This is powerful way, people's hearts and minds get invaded by horrible images and feelings. While normal logic is suppressed, people open their hearts and become possessed by the same Trapped Emotions. They block their hearts and control them. In a gossiping FR team, with very low results and relationships, they were openly sharing, "Oh, we talk negative things but we are so heartistic.. it's so nice". I reacted, "What?" and simply repeated the words she said... The emotional reaction of being hurt was so strong, as if I did the biggest crime. It's evil spirit behind. It want's to make you never dare to react again. It's manipulative technique, called "Conditioning". As a result everyone who gossips is a 'nice person', but those who don't like it are the bad guys. Gossiping is an evil give and take action with common base against others. A Four Position Foundation centered on Satan. It's not rational, but emotional sharing of displeased feelings. Allows Satan to invade. The negative view and thoughts in our head come from evil spirits.. Jesus said in a spiritual message, that "20-30 thoughts come in our heads each minute, from 20 to 30 spirits, including Satan. Unable to separate good and evil, a member may start talking freely, just as a pastime. He will multiply them in heartistic, intimate sharing, talking openly his fallen nature. The hearts of the others will be invaded by the same emotions. Thus, evil spirits expand their power and influence. Even short emotional reaction can be invasion by an evil spirit. For example, if we suggest DP reading, the person may jump with displeased emotion, "I don't like that". The leader may be invaded and compromise. So the evil spirit won, using the fallen nature of that person. You see, it's mostly about transmitting strong emotions to block something God likes. That's why, they love heartistic sharing of negative feelings against others, under the disguise of being themselves the victim; Usually portraying themselves as sensitive and hurting. They cannot live without it. For them this is love. They find people with common base and trust each other - thinking they are very heartistic. They are very effective in manipulating others with their displeased feelings. If there is no one to gossip to, they feel depressed. If you cut them, that this is wrong attitude, they will go against you. Evil spirits constantly talks in their heads against others. They are looking for common base with someone to start multiplying it. Meaning, they act as mediators for evil spirits and with the time this will become their own personality. The gossiping realm in Hell is one of the most painful ones - because of the heartistic pain, distrust and intrigues it creates. Why we see gossiping everywhere? (At work, in families, in communities, even churches). If gossiping is that wildly spread in history, gossiping spirits have to descend for resurrection. CIG cannot start if this problem is not solved both, in the physical and the spiritual worlds. Problems from the Old Testament, New Testament and even Completed Testament (in the Church) have to reappear to be resolved. Once Foundation of Faith and Foundation of Substance are set successfully, gossiping stops - evil spirits cannot work anymore. This has to be made successfully on family level, national level and world level, so God's Ideal of CIG can be established, free of Satanic invasions. "True Mother is True Father’s eternal partner and the position of True Parents cannot be compromised." 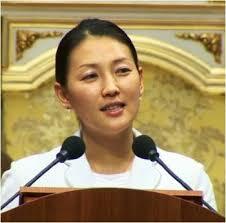 Hyung Jin's wife video is example of how manipulative gossiping can destroy TP. With soft, heartistic, sweet voice (so people can open their hearts), she shares all kind of twisted inner stories, to discredit TM. But the facts did not support the ugly picture she was so manipulatively depicting. Fixated on his negativity, Hyungjin cannot see, how his actions are leading to destruction of all Father achieved. He was invaded. As DP says, "Satan, who had been watching to see if there was any condition for him to invade in Noah's sons as his objects" DP: 260. Hyungjin created SC and brought this gossiping on world level. What do we do if our children or anyone in the family starts gossiping? We correct him immediately! "That's wrong! We don't do such things".. and explain why. There is zero tolerance to bad talk about each other. "Gossip is idle talk or rumor, especially about the personal or private affairs of others" - bringing distrust, divisions.. unity with Satan's heart! "Trust, joy, innocent, inseparable oneness, without any negative sense," that's how much beautiful and pure any family and community should be. The quote concludes, "This shows us that we need patience and obedience to go the way of Heaven.. However, Satan invaded the family through Ham's mistake." Providentially, all the resentful, gossiping spirits form all ages came to earth for the purpose of resurrection. Such bad habits cannot be overcomed in the spiritual world. They have to express in the physical world, be understood, reversed and restored. True Family is paying historic indemnity and takes the burden of all unresolved evil of the world with the sole purpose of quickly liberating the whole of humanity. All satanic powers working in history are now mobilized to destroy True Family. God and True Father, even from sp.w., sacrifices his own family for the purpose of fast indemnity and restoration. All trapped in Sanctuarly Church spirits can learn that they can be forgiven and loved, same like a True Child will be forgiven. This way their hearts will be liberated to come back to God. This is God's sole purpose - liberating all of his children, even from the bottom of Hell. Working for years with sec.gen. the biggest problem was always teams that were invaded by gossiping. It starts from one person and multiplies through such heartistic sharing, like Yeonah Nim. That evil triangulation stagnates spiritually the whole team. Soon the whole team gets invaded. Results drop, disunity comes.. only the gossiping people feel united and happy, when doing it. IT'S EVIL FOUR POSITION FOUNDATION - centering on Satan! Usually such habit is developed early in childhood. It's explained in the Unification Family Therapy lectures. To stop it, first you have to understand; Rumors don't help the Truth - they twist the truth in a strange way (Rationalizing something false - to sound as truth, that sifts your viewpoint to be negative from now on). You can sense they are satanic, because they bring doubts, fear and negativity - THINGS THAT BLOCK YOUR HEART. Noticing this emotional effect, you know for sure, they are not from God - but from Evil sp.w. That's their way of working! Remember, God never works this way! When I communicate with God and the high sp.w. - they always protect me. They are always careful, the way they give me any information about others, not to make me negative. They always show me in a way, so I can understand God's Heart, and the way to help, even to the worse person. Always so I can see hope, not be suppressed under fear or hopelessness. Through the years I had more and more victories in stopping such practices. Finally I learned to liberate the people who do such things spiritually and with education. Finally I succeeded to solve it on national level, later even on bigger scale. Yes, it is a spiritual thing and can be solved. We all have ancestors to liberate. There are also many collective sins connected to this problem that need to reappear and be resolved for the sake of the new world to come. We need to set victorious model of solving this problem. It's an excellent article. Thanks for sharing . I have noticed that gossiping is a big problem in our church. Thanks for helping us to understand the bigger picture. As a new member of FFWPU, i was so confused why there is such a division, and the irony is that it's between True Mother and HJN2. I've watched that video by Yeonah, the more it affected my inner self. Today Im reading this issue on gossiping, thank you, it made things lighter for me now. Biggest realization: DON'T DWELL ON GOSSIPS. Looking bad way at others, and make fun of them, as I see now, has much deeper and darker side in H2: Public, open multiplication of evil - accusations, judgement, labeling, hate-talk.. calling his mom bad names. What??!! Also... how he manipulates people in his hate? He uses GOSSIPS! Doesn't he! All things he points on Mother.. all are gossips. They are things we out of the Family don't know. Most of them do not even concern the Unification Movement. They are personal small things. He was supposed to protect Mother, even with his life.. even if she fails! How twisted his mind should be to enjoy such stuff? I write this, but my heart is crying, tears are dropping, pain is unbearable.. and I think I'm the one guilty for all of that. I want myself to go to Hell but liberate him. Because I love him. We all love him. So much.. so much! Help him to correct himself.. as fast as possible. Please! Thank you dear brother; you have a beautiful heart! Hello, I have been reading your blog. Good stuff. So sad to see my CARP mates being caught up with rumors. Not that I don't want to know the truth or believe blindly. - they twist the truth in a strange way. so you know for sure, they are not from God - but from Evil sp.w. That's their way of working! Remember, God never works this way! WHEN I COMMUNICATE WITH GOD and the high sp.w. - they always protect me. They are always careful the way they give me any information about others, not to make me negative. They always show me in a way, so I can understand God's Heart, and the way to help, even to the worse person. Always so I can see hope, not be suppressed under fear or hopelessness. Gossip is not the right word! The actual word that should be used is slander and it is a crime in any court of law! Thank you for this article ...it is truthful and clear. It is exactly what is happening in our movement at this time. TF "ALL Tc MUST FOLLOW TRUE PARENTS"
Hyungjin: "If I deny True Parents you must not follow me"